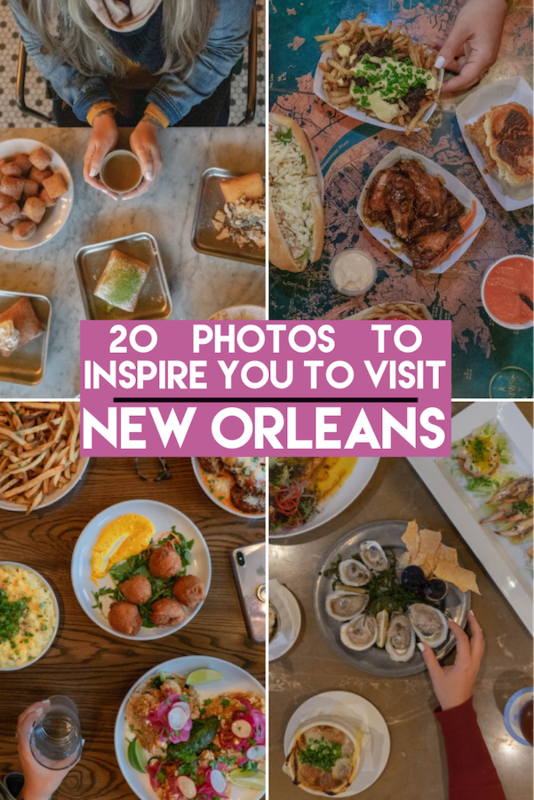 I recently traveled to New Orleans for the second time and although my trip was dampened with non-stop rain, I still had a blast exploring (and eating) around the city! Even in the rain, New Orleans has heaps of charm and character and I even spent eight hours one day walking around (in the rain!) just taking photos. 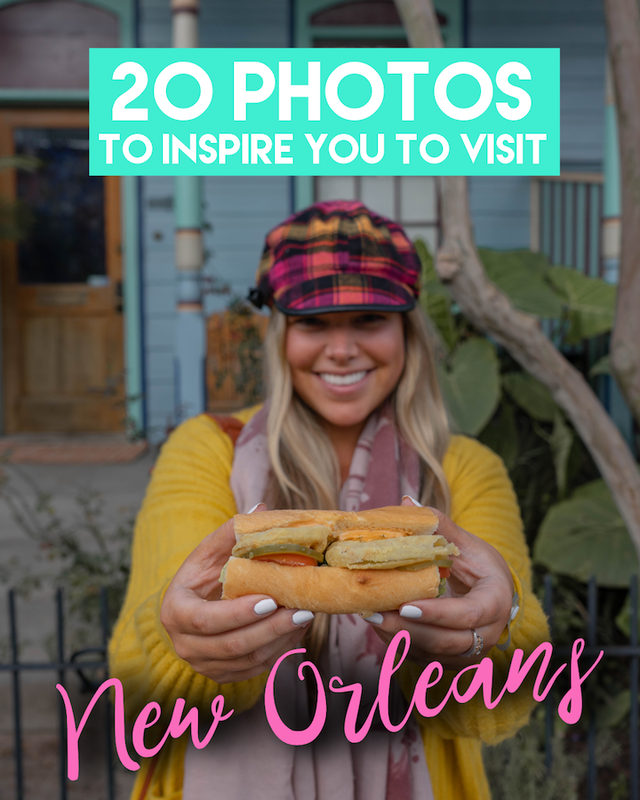 I had so many photos that I felt I had to do this round up of 20 photos to inspire you to visit New Orleans! 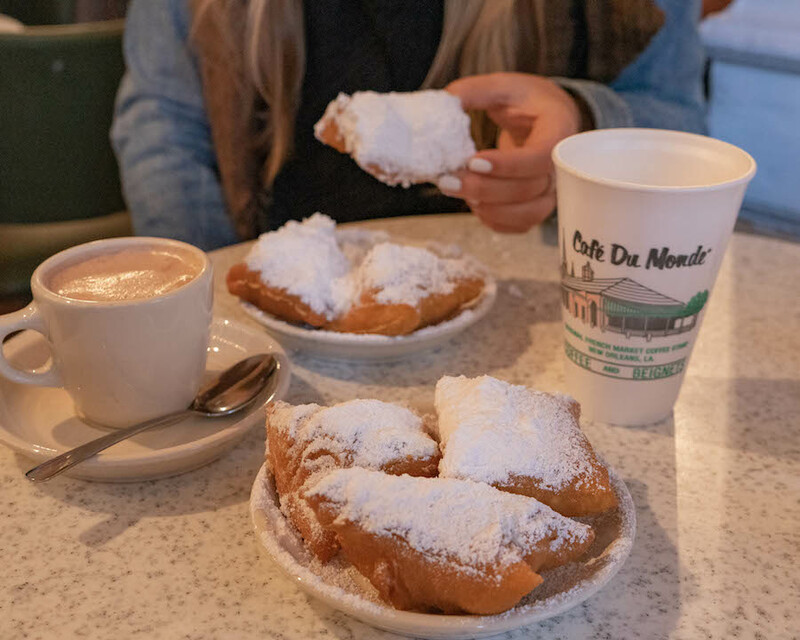 Let’s get this party started with a New Orleans staple – beignets at Café du Monde! 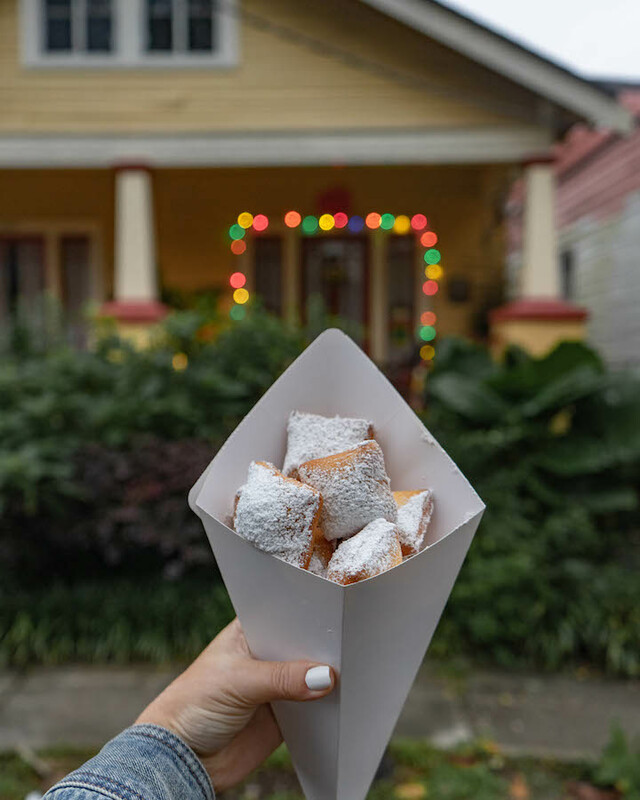 I had so many delicious beignets (like these from The Vintage that I even wrapped up the Ultimate Guide to Beignets in New Orleans. 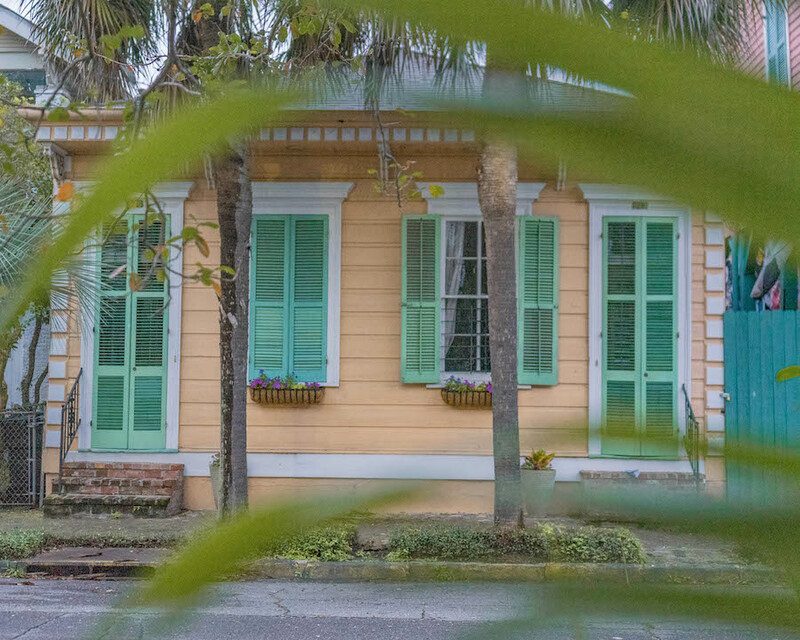 The colors of New Orleans are something truly special. 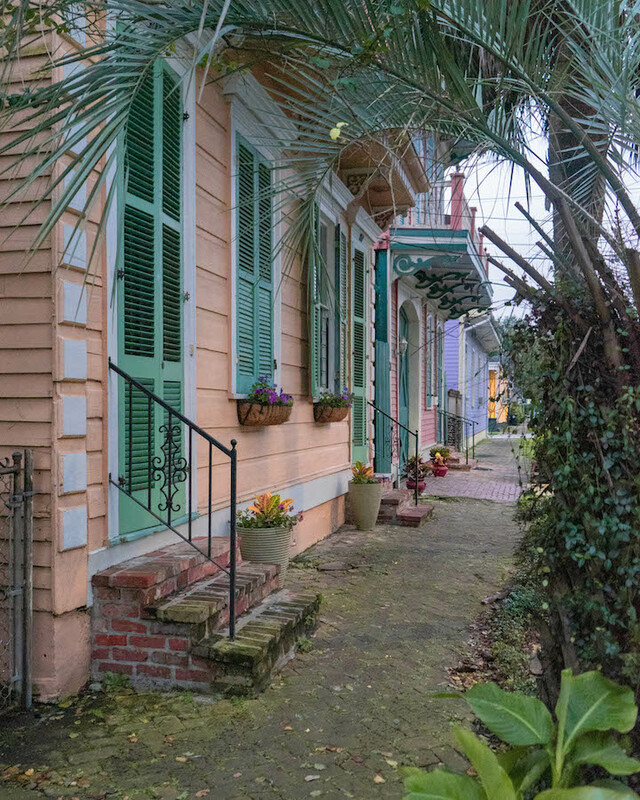 I loved photographing the colorful facades like these in the Garden District. 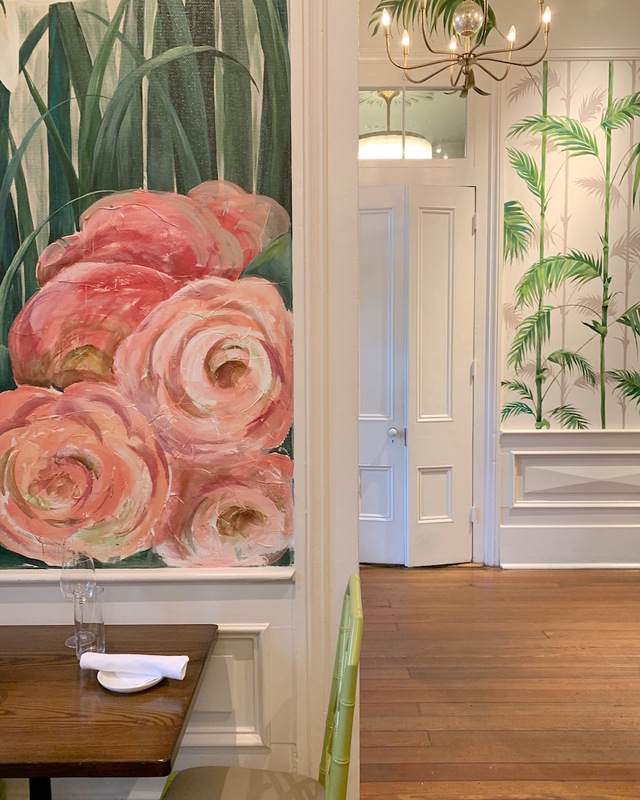 And speaking of colors, the interior design of Country Club spoke to my soul with beautiful florals and pops of palms. 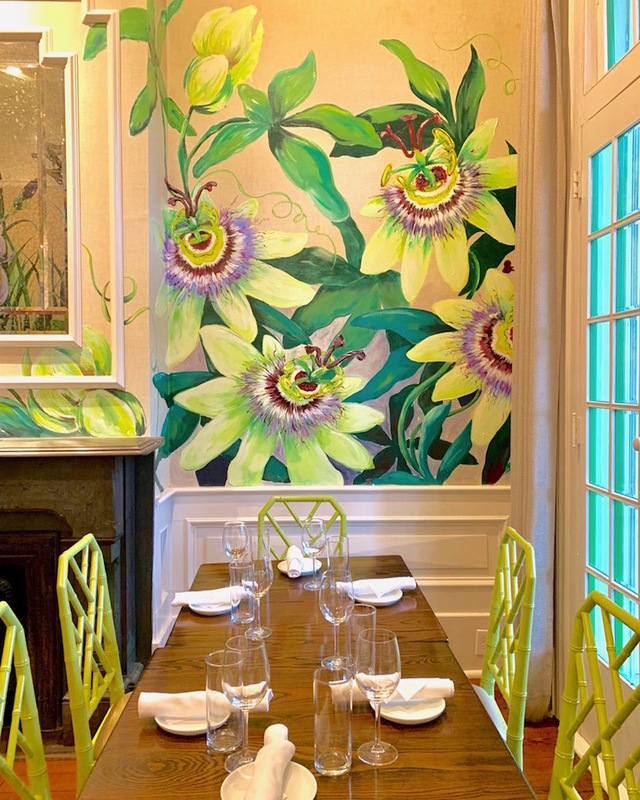 If the design of Country Club stole your heart, the delicious eats will keep it forever. 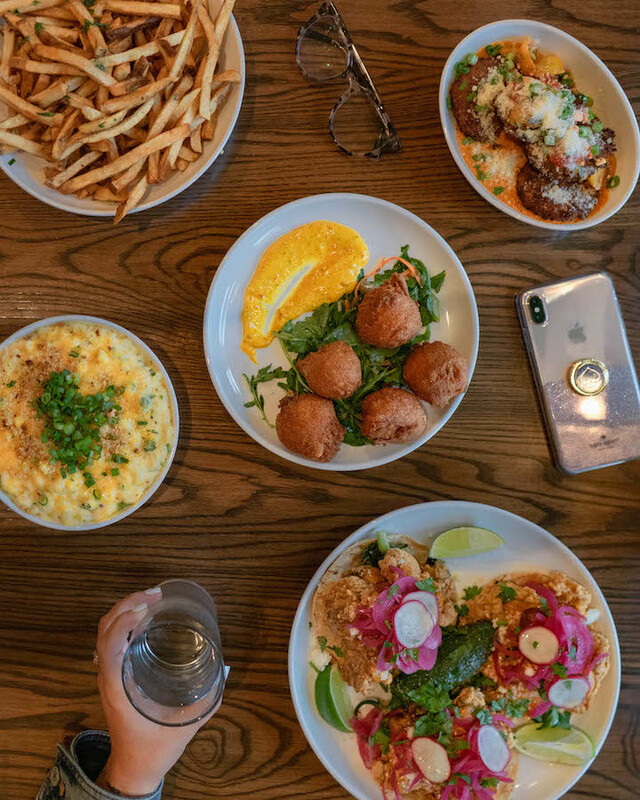 From the oyster tacos (bottom right) to the crab beignets (middle) to the truffle mac’n cheese (middle left) to the fried green tomatoes (top right) – everything we had was to die for! Thanks to Haley of Ready Set Jet Set for capturing this shot! 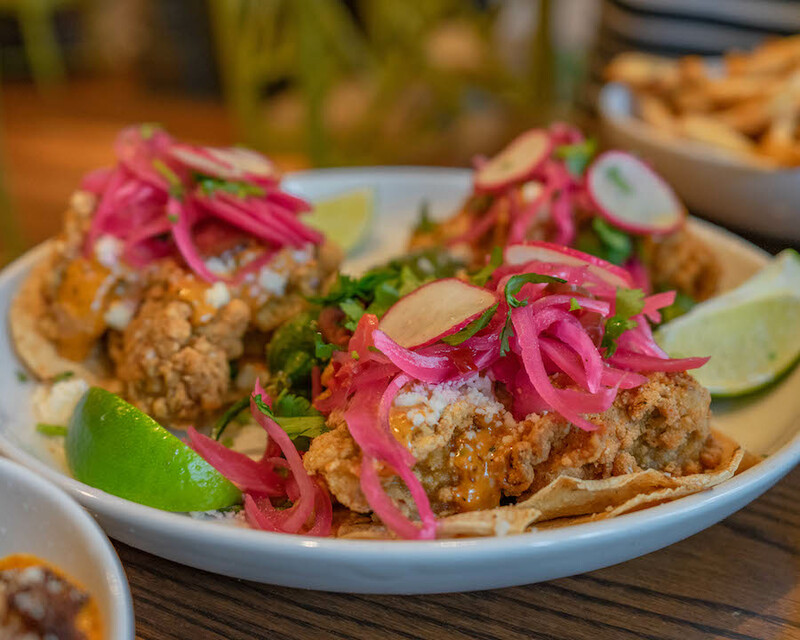 One more time for the fried oyster tacos from Country Club– easily one of my favorite savory bites of the trip! 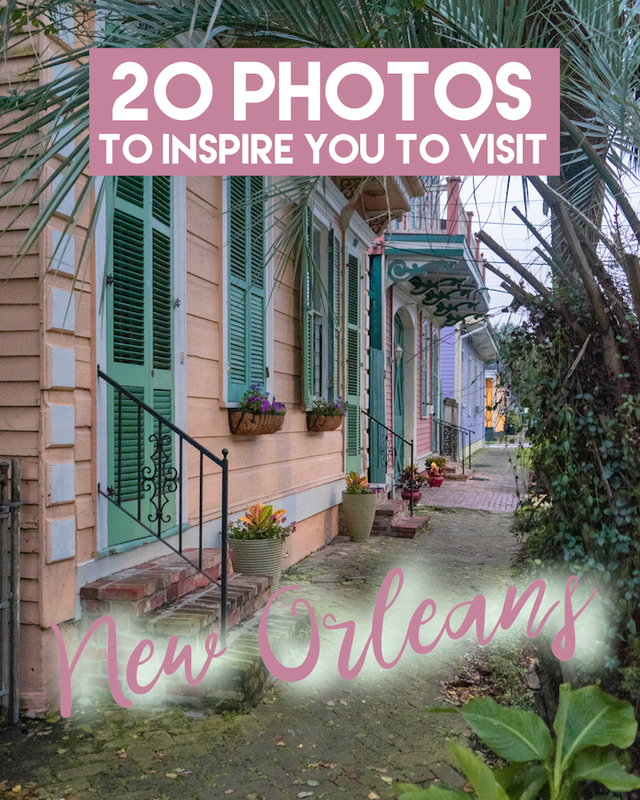 I loved easily getting lost along the streets of New Orleans capturing shots of ferns, gas lamps and French doors. And when the facades are this colorful – can you blame me?! I had fun framing out some of my shots in between palms. 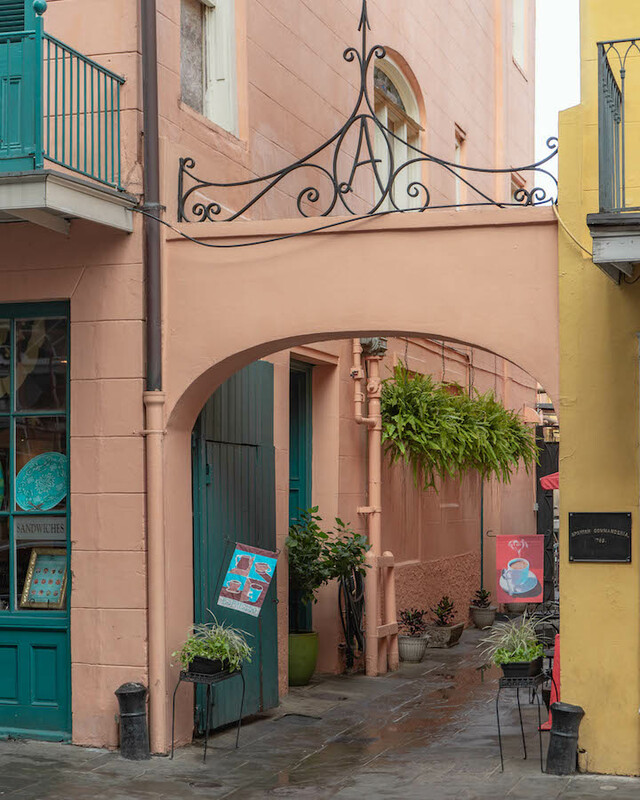 The cutest little corner in the French Quarter – adorned with ferns! 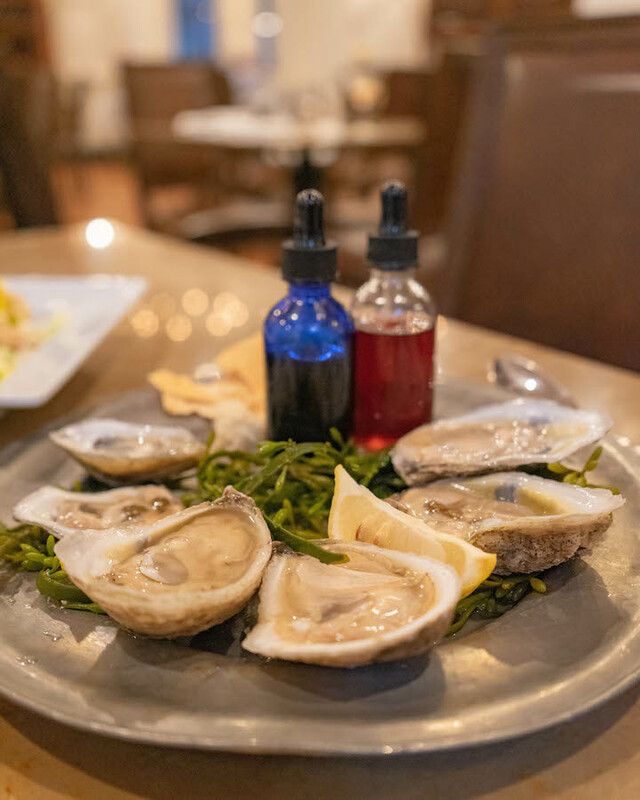 Oysters are #KindOfaBigDeal in New Orleans and the oysters at Tableau in the French Quarter did not disappoint. Their delicious seafood (and perfect French onion soup) were all some of the best I had all year! Thanks again to Haley for the photo! 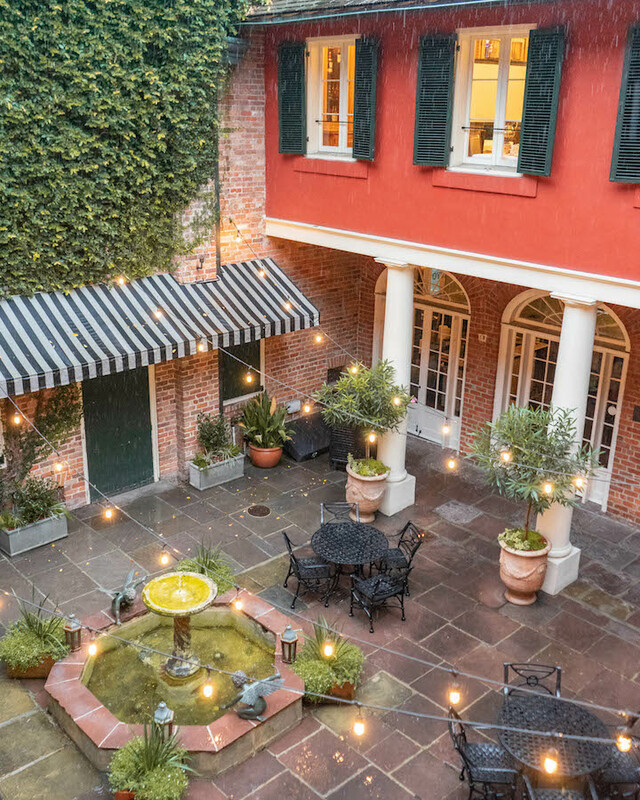 Even in the rain, the courtyard at Tableau was a picture-perfect photo-op! I can only imagine how perfect this patio would be during a hot summer night. 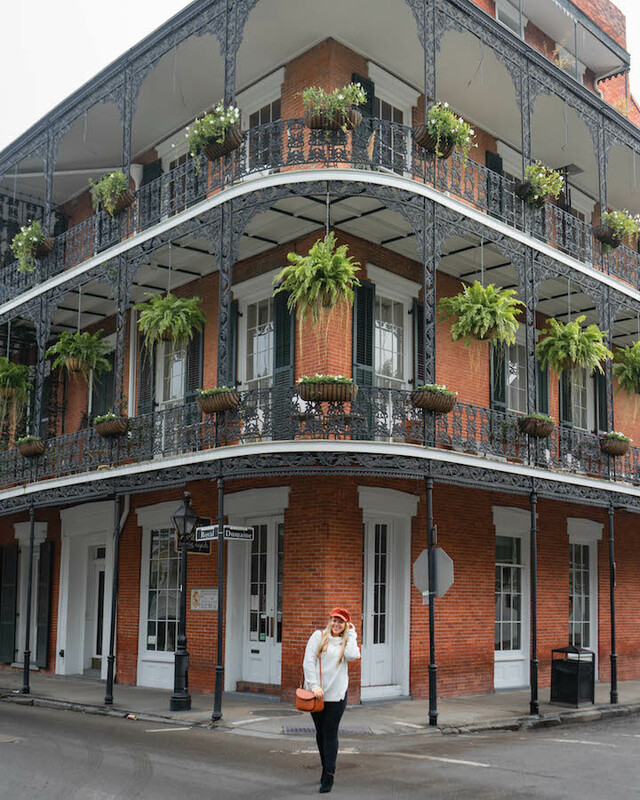 This building is a must-shoot spot in New Orleans and when your outfit matches the façade – it’s even better! Thanks again to Haley for helping me with my photos! 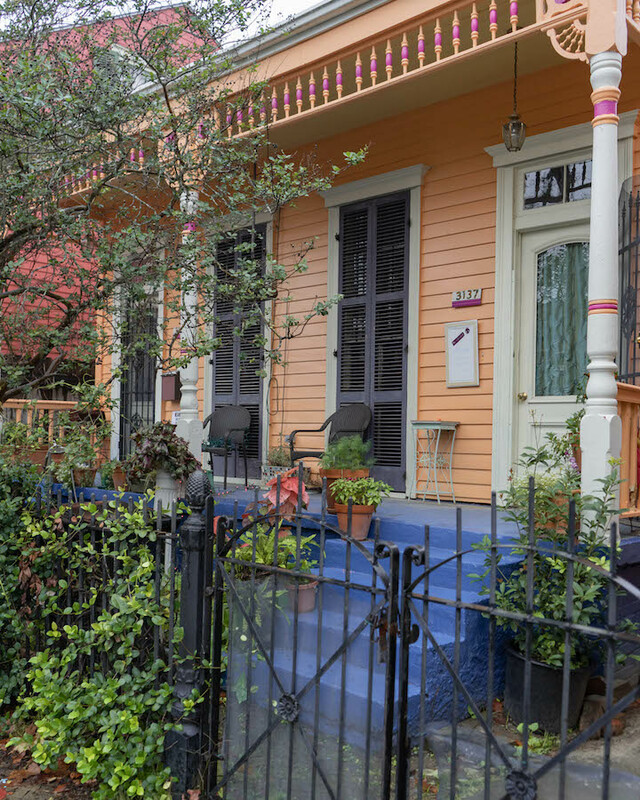 This home, with the bright blue patio and pops of fuchsia, was one of my favorite façade color combos. 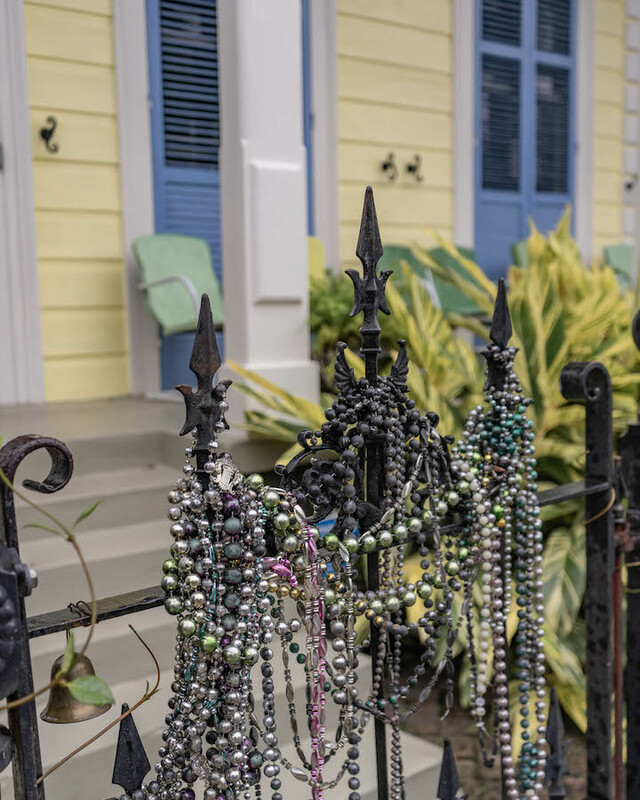 While I didn’t visit New Orleans during Mardi Gras – remnants of Mardi Gras traditions can be spotted around the city. If you go to New Orleans and don’t eat a po-boy, did you really go to New Orleans? 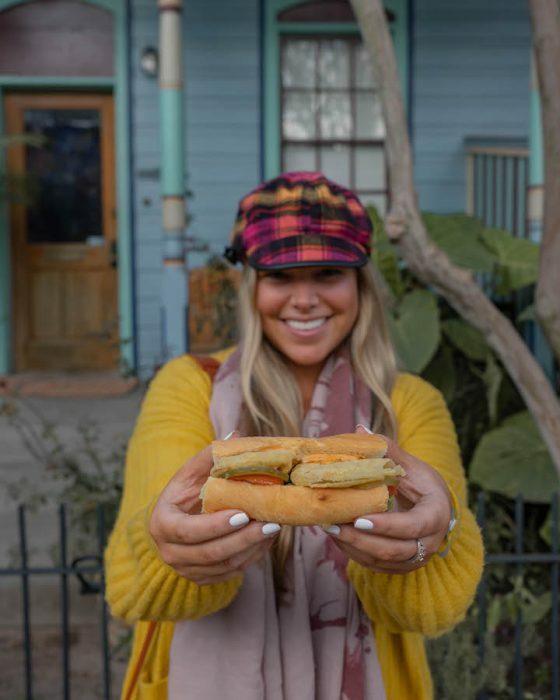 I hit up Po’Boy Fest on my first night in NoLa and *LOVED* this fried green tomato po’boy. 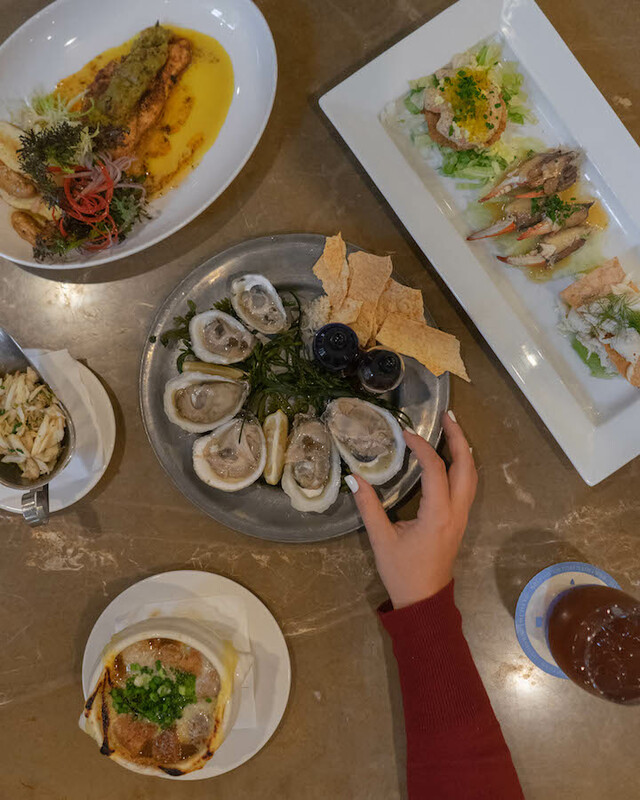 One more time for the deliciousness of everything New Orleans. 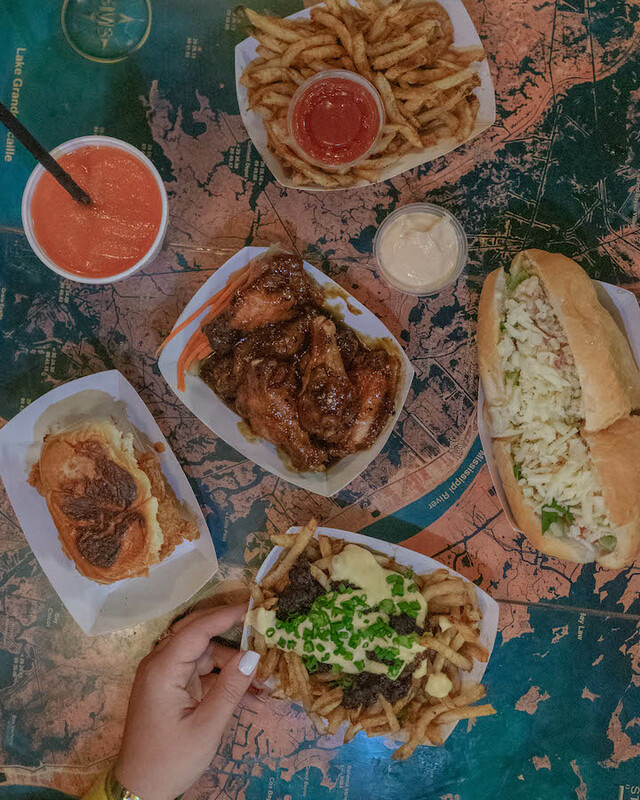 This spread from Bouree was *delicious* from the frozen Hurricane (top left) to the kimchi and lemongrass wings with miso aioli *drool* (middle) to the chicken salad po’boy (on the right) to the burnt brisket ends cheese fries Haley snapped me grabbing. 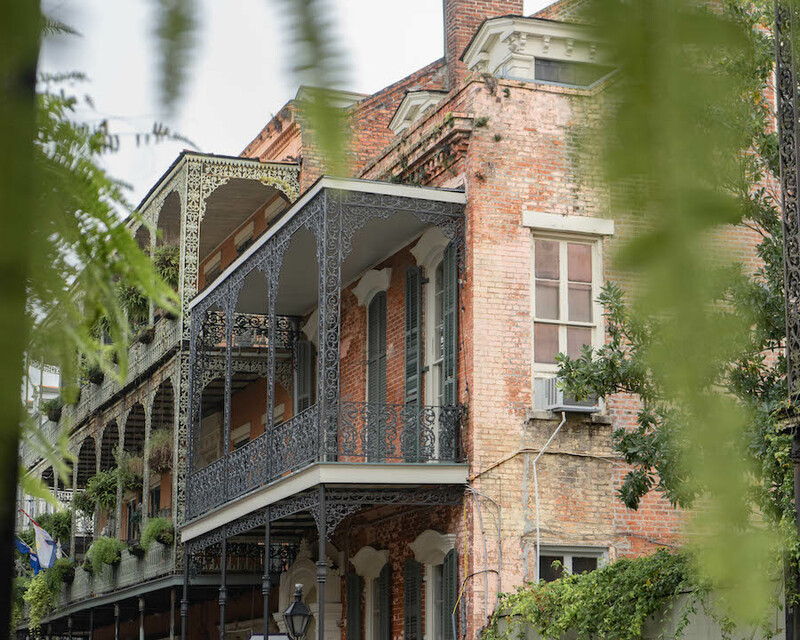 All in all, rain or shine, you’re bound to have a blast in New Orleans. 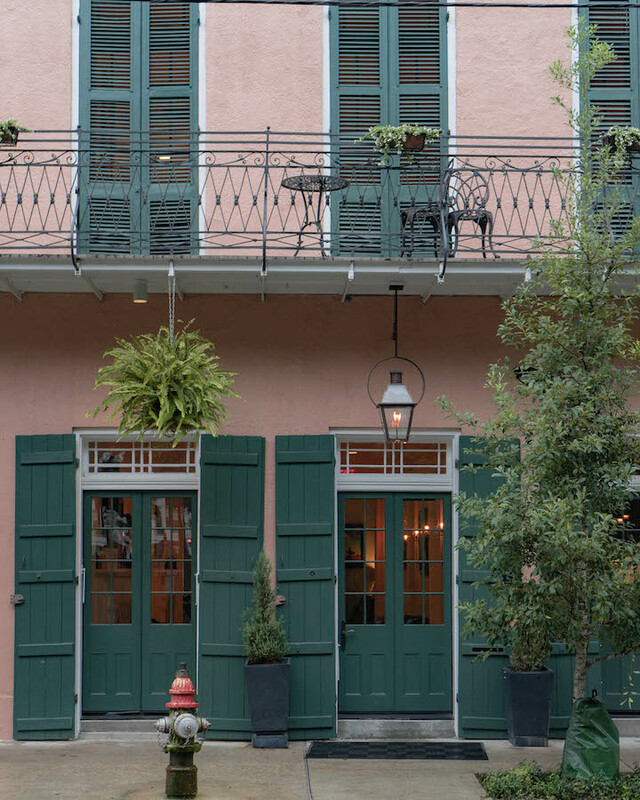 From the food to the facades – everything will captivate you and pull you in hoping for more. 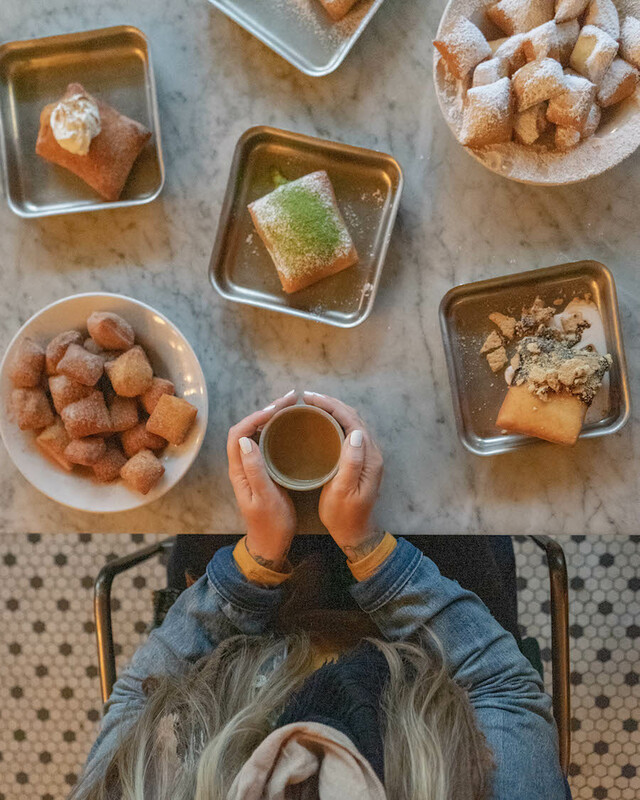 I know that myself, personally, could go back and chase facades and foodie flatlays for days! So, tell me, have you been to New Orleans? 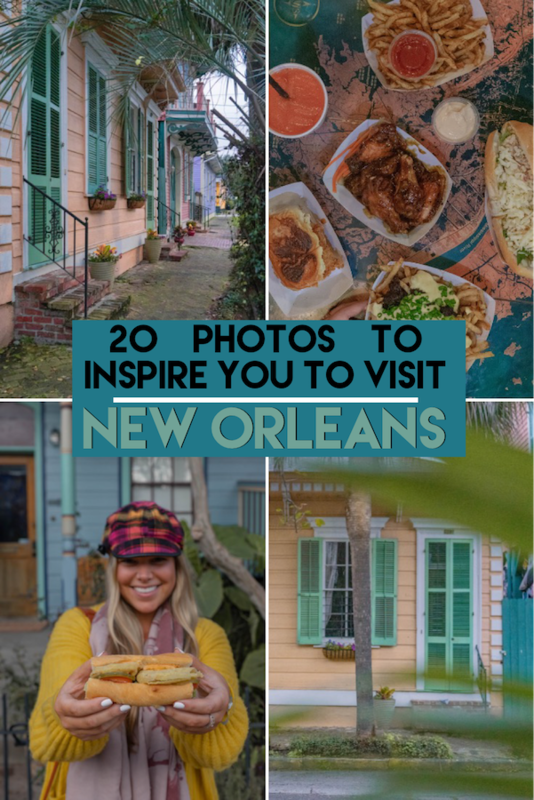 If not, have I inspired you to visit?! Disclaimer: I was hosted in New Orleans as a guest of New Orleans & Company. My opinions, as always, remain my own.